I used to be so good about making new goals and resolutions every new year, and I’d check back periodically to see where I was and how my goals have changed from year to year. Even though it’s almost the end of the month, I still wanted to sit down and make some new goals for the new year. I don’t typically make goals that don’t have deadlines or aren’t measurable, but that’s what I’ve found myself doing this year. Some of them are measurable, but some are just trying to do more of the things that are good for me. I was a little nervous about the half and full but I was determined to do it. I decided to splurge on the Race Retreat, which is a private tent for before and after the half and full. I forgot about it and ended up having to go back to the expo to get the wristband for it. I woke up at 3 on Saturday and took the monorail over and made my way to the Race Retreat tent. In addition to new restrictions on costumes, they were also checking all bags, even small running belts. P had bought me a new FlipBelt because I misplaced both of my Spibelts, but the check was really quick since I only had my credit card in there with some cash. The Race Retreat was pretty nice. They had bananas, bagels, and coffee and they had all the characters from Pinnochio for photo opportunities. The half was pretty good and the same course as what I remembered from the Princess Half last year. I was dragging pretty hard by mile 7, but instead of just switching to more running to get it over sooner, I forced myself to keep my walking intervals in there too. After the race I indulged in a 10-minute post-race sports massage before going back to the Grand Floridian. I also made myself sit in an ice bath for 10 minutes. I felt great and not sore at all and I was really amped up and talking a million miles a minute. We didn’t go to any of the parks that day but we went to Disney Springs and saw The Force Awakens. We’ve been waiting to see it so we could be together for it and I absolutely loved it. Disney Springs also looks great and the movie theatre we went to had dine-in food and a full bar. So we watched the movie while noshing on delicious burgers and drinking draft beers. Sunday morning I was ready and woke up right on time again. I was so anxious I forgot to put my bib on! I went back to the Race Retreat, and was a little disappointed to see if was still Jiminy Cricket and Pinnochio again. I would have liked to see the switch out the characters from day to day. P had gotten up early and went to Hollywood Studios and rode Star Tours over and over again until he felt sick so I texted him when I was getting close and we found me as I was going through. I was getting more excited then because I knew I was almost done. I was definitely tired by mile 22. I didn’t feel bad or tight, just that I was ready to be done. I made my way through the Boardwalk which was so crowded it was hard to get by anyone, and then finally through EPCOT to the finish. I was so excited to be done and though I felt fine, I knew I’d be hungry so I went back to the Race Retreat tent and had some brunch there. It was all very good and much welcomed after running for over five hours. The characters were still the same again, and the massage area was backed up for 45 minutes and they were only doing 10 minutes at a time. I walked over to the main massage tent, where I waited for less than five minutes and then really indulged in a half hour sports massage. My hamstrings felt pretty tight so I did another ice bath for 15 minutes back at the hotel and then rubbed some Thermoderm onto them. We went back to EPCOT and Hollywood Studios for the day though I had to call it an early night again because I was exhausted. I never felt sore like I thought I would, but the balls of my feet were tired and my hamstrings were a little tight. With the running and walking, I clocked over 36 miles total that day. Looking back, there are a few things I’d do the same or differently. Run/walk intervals. These made such a huge difference in keeping me from being sore and staying happy. Ice baths. They definitely work and I think also helped keep the soreness down. After the full I had zero issues squatting or with stairs. I’ve always had some stiffness before so it was strange not to. Sports massages. Because you’ve earned it and they feel amazing. Bring two pairs of shoes. It rained a lot on the 10K so it was great to have a second pair of shoes for the half and the full. Race Retreat. It was $230 for two days and I don’t think it was worth it. If they’d switch out the characters and serve beer and champagne after the races, I’d be all in. Not stopping for characters, especially on the full course. Honestly, I should have stopped for more characters. It’s a fun race, after all. I have a little time as P is doing homework and I’m henna-ing my hair so I thought I’d do a recap of the 5K and 10K that were the first two races of the Dopey Challenge. Also, I didn’t bring a camera with me so all I have are the fuzzy ones from my phone. I apologize in advance. 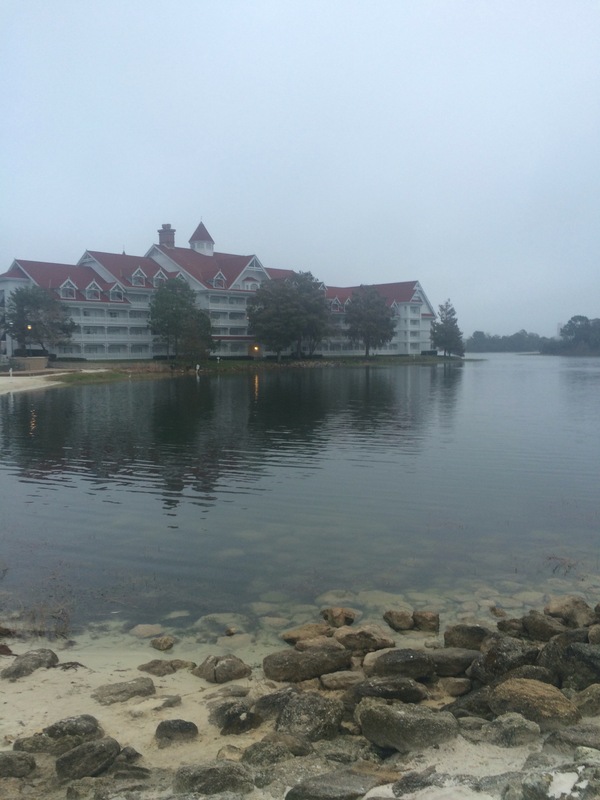 I got into Orlando Tuesday night and we took Mickey’s Magical Express to the Grand Floridian, where we were staying. 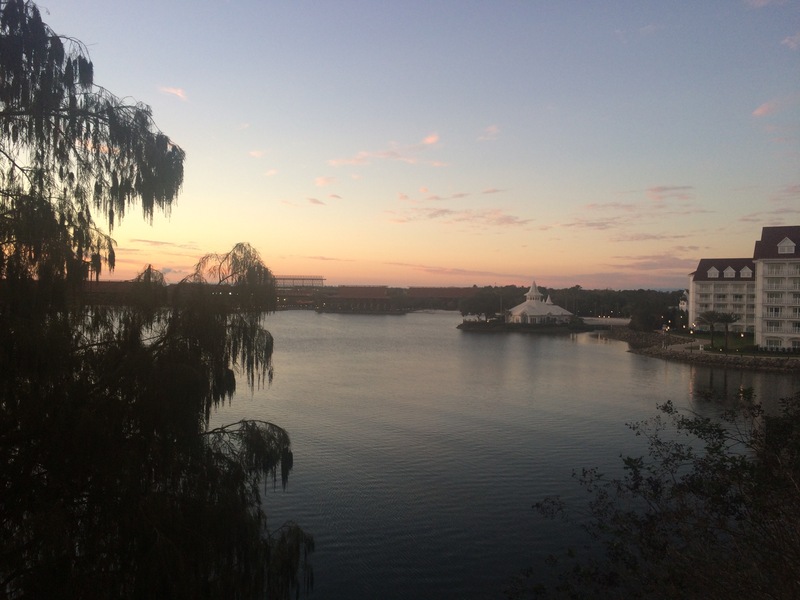 I had originally booked a room at the Yacht Club, but with the military discount it was actually cheaper to stay at the Grand Floridian. I really liked the hotel. The lobby is scented with something amazing and we even had a lagoon view. The picture above is one I took from our balcony. Wednesday morning we both woke up early enough that we had time to kill before the expo opened so we went over to Magic Kingdom and rode a few rides. It was very quiet and we had no wait for a lot of things that got busier as the day went on. I went to the expo and picked up my race packet and got my picture taken with my bib. I looked around but didn’t see anything I wanted to buy. I had really wanted one of the marathon Dooney & Bourke purses, but due to manufacturing issues they weren’t able to produce them in time. I was pretty bummed about that so I didn’t end up buying a purse but I did buy a nice running hat with a screen print of a castle on the front. We went over to EPCOT afterward for some food and drinks before heading to bed early. They do bus transportation for the 5K and 10K so I decided to wake up at 4. I was out the door in about 10 minutes and had no issues getting to the start. It was a little chilly but there was a big tent we all huddled into and that helped a lot. The 5K course was pretty nice. There were a lot of characters out but I had a photo shoot scheduled that morning so I didn’t have time to stop and wait in line. I finished the race and then had to wait for the buses to start running. The buses use the same road as the runners so some of the last corrals had to run by before the buses could load up. I was a little stressed and ended up getting off at the Polynesian and running over to the Grand Floridian and did my makeup and shower in a hurry before hustling over to the lobby to meet Jason and Sara of Concept Photography. We did that in the morning until we ran into our lunch reservations at Be Our Guest and had to part. I was so excited for BOG, but it was kind of lackluster this time around. The food wasn’t as good as I remembered and the special effects weren’t enough to overshadow it for me. We did some more rides in Magic Kingdom before I wanted to change my shoes and we went back to the Grand Floridian so I could wear something more comfortable. Friday morning I decided to wake up at the same time even though the race started 30 minutes earlier. Unlike Thursday morning, I didn’t see another runner until I got to the bus stop which made me a little nervous. Fortunately, I made it with plenty of time. I also wasn’t in the first corral so I had some buffer there, too. The 10K course wasn’t anything super special, but they had some characters that I hadn’t seen before. The lines were really long, though so I didn’t end up stopping. I also made the hard choice to take it easy and do a lot of walking because I was a little nervous about the half and the full I still had to do. Even though I was halfway done with races, the distance wouldn’t be halfway until almost mile 2 of the full marathon. My favorite part of the 10K course is the Boardwalk area. It’s really pretty in the dark and always lifts my spirits when I go through there. I actually didn’t even know it was back there until I did the Enchanted 10K last February as part of the Glass Slipper Challenge. I felt really good going into the half and full, but just nervous about the distances and mostly how I would feel after. I resolved to do a LOT of walking early into the races and keep a solid interval going the whole day. I’m about halfway through the races with the Dopey Challenge, but only about a quarter of the way through the distance. I’m having a great trip and trying hard to take it easy, which is difficult because it’s Disney and I always want to do everything! 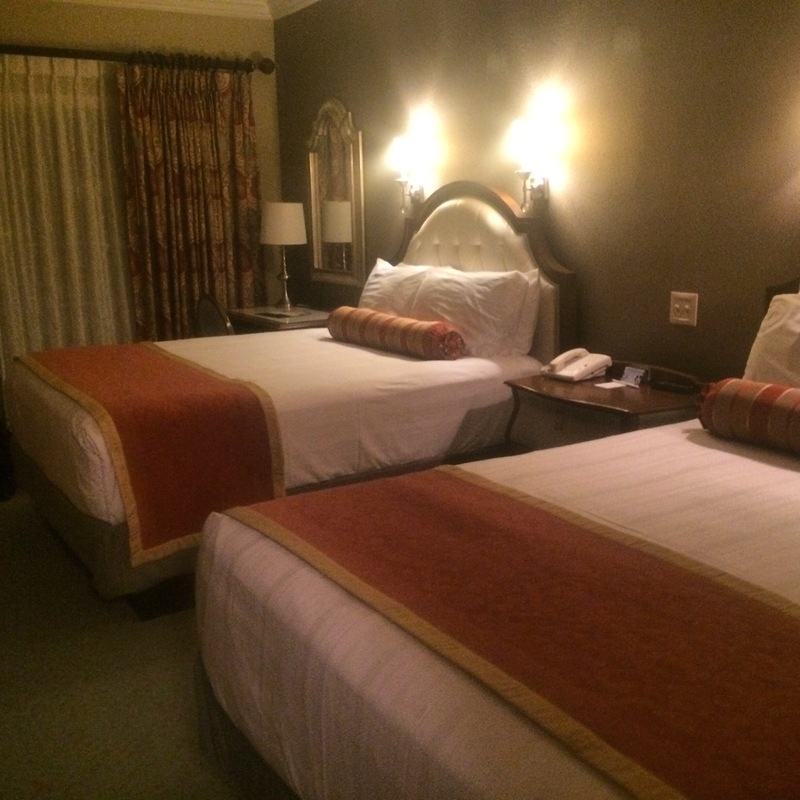 I got a great rate at the Grand Floridian that made it even cheaper than the Yacht Club, where we were originally gpong to stay. The only “clean” picture I have of our room. It’s strewn with race clothes now. 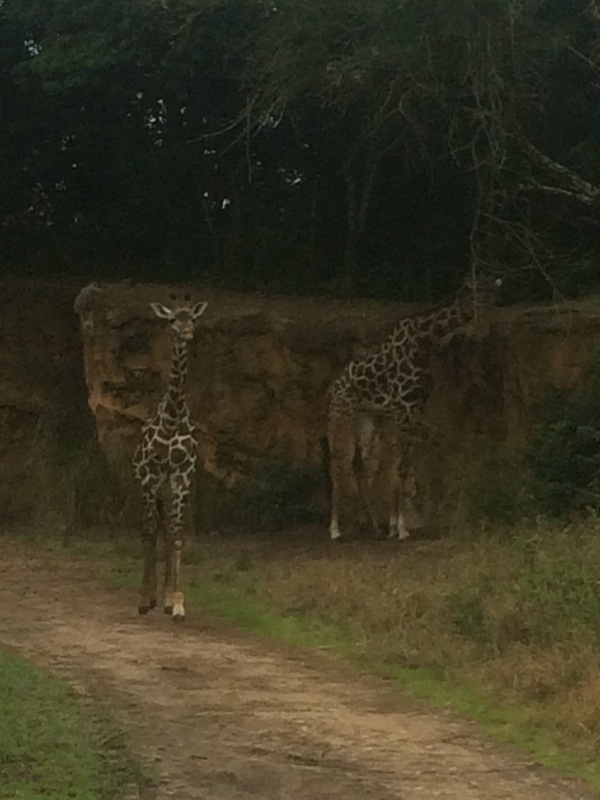 One of our newest favorites is the Animal Kingdom park and the shows in there. We both like Findinf Nemo: The Musical and The Festival of the Lion King. 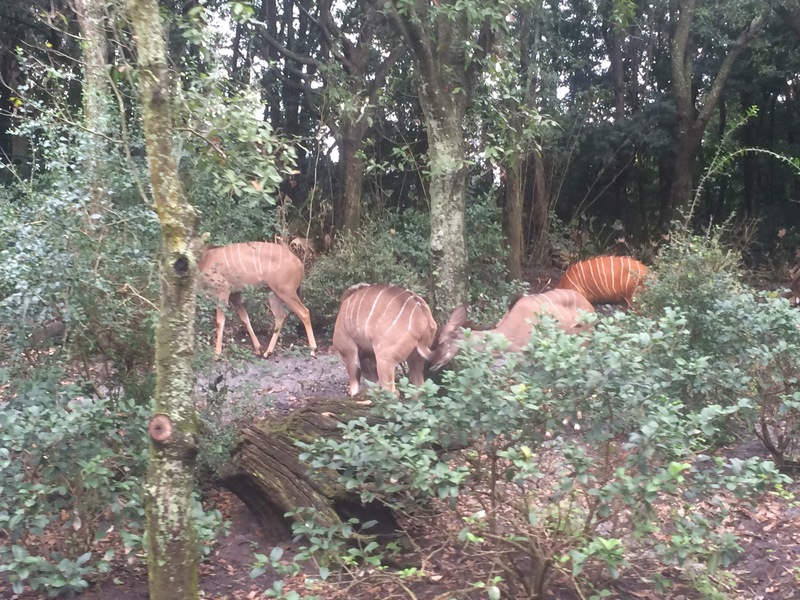 I also can’t believe we’d never done the Kilimanjaro Safaris. I’m a little nervous for the half and even more nervous for the full. I’m not worried about the distance, and I know I can make the time, I just don’t want to hurt myself. I made myself do a 1:1 walk and run ratio yesterday and I think I will do the same today and tomorrow. Today is going to be an easy day. We’ve already said we’d go see Star Wars (we wanted to wait to see it together) and just walk a little bit around the new Disney Springs area. I’m probably going to be unable to post my workout recap for a while, so I will probably just save it all until I get somewhere more permanent. I’m in Kuwait for a little while as a I wait for my next flight. It’s actually really nice here, and I’m thankful for an intermediary step in between Afghanistan and my final destination. I never realized how deeply tired I was, or how badly I sleep at night. It’s pretty strange to not have anywhere to be all day and no work to do. Thankfully I have a couple of friends here who have been nice enough to give me directions, eat meals with me, and just hang out. I’ve really missed friends and having girl-talk.